A Turkish charity worker helps a Kyrgyz woman carry her aid package. Thousands of Kyrgyz in several parts of Kyrgyzstan have kicked off the Ramadan with a smile on their faces after a Turkish humanitarian aid agency distributed food packages. 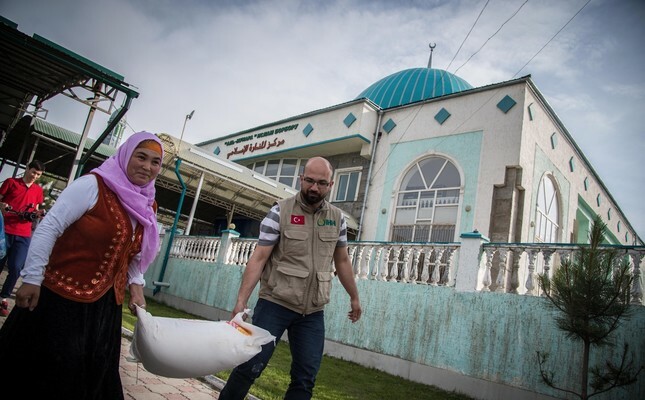 Turkey's Humanitarian Relief Foundation (İHH) traveled to Kyrgyzstan on the eve of the Ramadan to help thousands of people in the country start off the holy month with full plates on tables. Gülseren, 45, is one of them. Mother of three, Gülseren has had to live without a spouse for a long time after his husband passed away of an illness. Living in a suburb of the Jalal-Abad region of Kyrgyzstan, which is at the Uzbekistan border, the 45-year-old welcomes the Ramadan food package with thankful eyes. She lives in a scrappy house with no bath and a toilet in a very poor condition. To add further misery to her situation, she has had to live apart from one of her sons as her youngest son, the 13-year-old, lives in an orphanage. In a region where unemployment among the youth is strikingly high, Gülseren needs to take care of his two sons as well. Yet, her entire income in a month is the 1500 Kyrgyzstani Soms ($22) from the state as one of her sons is disabled. For a mother in such conditions that has only $22 at the start of each month, a Ramadan package is nothing but vital. What comes after the Ramadan package, however, she does not know either. "It will take care of our needs throughout the Ramadan, but I don't know afterwards if not for the humanitarian aids," she said. Located in Central Asia, Kyrgyzstan has a relatively modest population of 6 million and borders countries such as China, Uzbekistan, Kazakhstan and Tajikistan. Having gained independency following the fall of the Soviet Union in 1991, Kyrgyzstan has come a long way in terms of overcoming low living conditions, yet the most of the country is still reeling under the burden of poverty. Today, every one in four families lives way below the poverty line and must ponder over what will be cooked in the evening with what is left in the kitchen. In this respect, Kyrgyzstan has been a focal point in the efforts of the İHH. Hamza Nedimoğlu, Deputy Coordinator for the İHH's Central Asia Department, said Kyrgyz authorities have always been a helping hand for the organization. "Neither the local authorities nor the people of Kyrgyzstan cause us any problems. We are able to carry out quick projects in the area of concrete works and social engagement," he said. İHH aims to deliver Ramadan food packages to as many as 1,000 families, or at least 5,000 people in total, in different parts of the country. Furthermore, it will host a fast-breaking meal to more than 500 people during the holy month in different provinces. On the first three days of the Ramadan, the nongovernmental organization reached out to poor families in Bishkek, Osh, Jalal-Abad and Issyk-Kul. Nedimoğlu said such humanitarian aid efforts continue throughout the year. Apart from that, the İHH looks after orphans as part of its different programs. The humanitarian organization helps the Kyrgyz in remote parts of the country to have access to places of worship as well. The İHH authority said that the organization has completed three mosque projects and three others are still underway. "We have two mosque projects in the Issyk-Kul region, one in Jalal-Abad region and three in the Chuy region. We continue to carry out and expand these projects with the help of our benefactors." Aside from the Ramadan aid in Kyrgyzstan, the humanitarian organization aims to reach out to hundreds of thousands of people all over the world. "In total, 300 thousand food packages costing 100TL will be distributed to those in need both in Turkey and abroad. Aid will be distributed in the form of food aid, hygiene supplies, clothing, and also chocolate, toys and clothing for children," the İHH recently said on its official website. Moreover, the organization seeks to bring 40 children from 15 countries, including Bosnia, Albania, Kyrgyzstan, Azerbaijan, Pakistan, Lebanon, Palestine, Niger, Afghanistan, Chechenia, East Turkistan and Syria to Istanbul, Turkey on the 15th day of the Ramadan to hold a large scale festival.